“Are you praying?” I asked. Snippets of conference talks and Ensign articles and scriptures came flooding into my head. I knew that when prayer “doesn’t help” the possibility is high that we are praying amiss. But after a couple of futile attempts to break in and dispense “wisdom” to Jody I realized this was the time to just listen. The only words from me that seemed to get through to her were, “Remember you are loved.” She choked up at that and invited me to call her back. Our trials are all different, but no one is exempt. How can we avoid “praying amiss” in times of trial—or any time? I’ll never forget Elder Neal Maxwell ‘s response to the cancer that eventually took his life. Not “Why me?” but “Why not me?” and “What can I learn from this?” He didn’t waste time reminding the Lord of all his good works or try to convince God he didn’t deserve what he was getting. Yet who among us has not had moments when our prayers sounded more like “why me”? than “Thy will be done”? 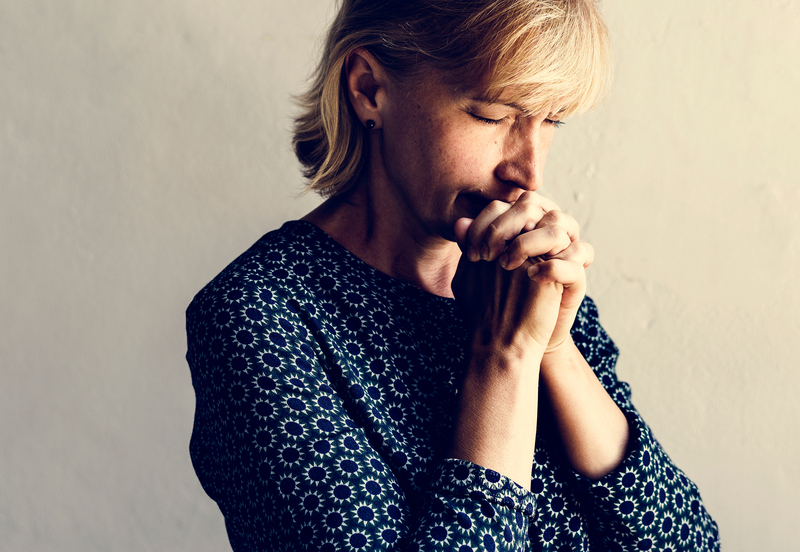 When we try to convince God that our righteous acts should shield us from natural law, from consequences of our choices or the choices or others, or from the trials God uses to tutor and refine us, we are praying amiss. If we would avoid praying amiss, the Savior’s example gives us the perfect pattern to follow. Above all men, Jesus didn’t “deserve” any of the poor treatment or suffering that he endured. When he was in the Garden of Gethsemane, “he was withdrawn from them, [Peter, James, and John] about a stone’s cast, and kneeled down, and prayed, Saying, Father, if thou be willing, remove this cup from me: Nevertheless; not my will, but thine be done” (Luke 22: 41-42). What happened as soon as Jesus prayed this courageous prayer of submission to His Father’s will? “And there appeared an angel unto him from heaven, strengthening him” (Luke 22: 43). It is meaningful to ponder that even Jesus, the Son of God, needed strengthening. The level of our personal suffering rarely merits an angel, but we can always count on being strengthened when we submit ourselves in prayer to God’s will. Peace comes when we pray “Please comfort my soul in Christ and strengthen me to bear what I must bear,” rather than “Why is this happening?” or “Please change it.” More often than not, the Lord strengthens us to bear our burdens or trials or pains rather than remove them from us because He knows they will be to our ultimate good in the refining of our character and keeping us humble. The Apostle Paul is a good example of this principle. He said, “There was given to me a thorn in the flesh, the messenger of Satan to buffet me, lest I should be exalted above measure. For this thing I besought the Lord thrice, that it might depart from me. And he said unto me, My grace is sufficient for thee: for my strength is made perfect in weakness. Most gladly therefore will I rather glory in my infirmities, that the power of Christ may rest upon me” (2 Corinthians 12: 7-10). After asking three times that the thorn would “depart,” Paul learned directly from the Lord that there was purpose in the thorn, and he changed his prayers. Sometimes accepting the Lord’s will in the time of trial can be like an Abrahamic test. I remember hearing Ed Pinegar and his wife speak of their struggle to surrender their son to the Lord’s will when he had been in an accident and was dying. Only when they changed their prayers to submission to and faith in the will of God for their son did they find peace. And again, verily I say unto you, my friends, I leave these sayings with you to ponder in your hearts, with this commandment which I give unto you, that ye shall call upon me while I am near—Draw near unto me and I will draw near unto you; seek me diligently and ye shall find me; ask, and ye shall receive; knock, and it shall be opened unto you. Whatsoever ye ask the Father in my name it shall be given unto you, that is expedient for you. And if ye ask anything that is not expedient for you, it shall turn unto your condemnation. Only through the Spirit can we know for sure what is expedient. “Two men went up into the temple to pray: the one a Pharisee, and the other a publican. The Pharisee stood and prayed thus with himself, God, I thank thee, that I am not as other men are, extortioners, unjust, adulterers, or even as this publican. I fast twice in the week. I give tithes of all that I possess. And the publican, standing afar off, would not lift up so much as his eyes unto heaven, but smote upon his breast, saying, God be merciful to me, a sinner. I tell you, this man went down to his house justified rather than the other: for every one that exalteth himself shall be abased; and he that humbleth himself shall be exalted” (Luke 18: 10-14). In Alma 31 the Zoramites matched that definition. If ever there was an example of “praying amiss” their repetitive prayer would be it! They thanked God that they were separated from their brethren, elected to be “His holy children, to be saved while all around would be cast into hell,” and most astonishingly, thanked God that they were elected not to believe in the “foolish traditions” of Christ! Thankfulness is an important part of the prayer of peace; but this prayer was not a prayer of gratitude, but of prideful boasting and self-deception. any time we ask the Lord to ignore someone else’s agency. My friend and I were praying amiss when we asked the Lord to change another person to suit us—to make our lives easier by not having to deal with that loved one’s weaknesses. The Lord will not short-circuit the process of growth. In my case, only when I began praying to see my own part, to overcome my own weaknesses, to know how I could change did I find peace. How often had I been, in effect, confessing someone else’s sins in my prayers rather than confessing my own? I was far too much like the self-righteous Pharisee who did not recognize his own pridefulness. Another time I learned this same lesson at an even deeper level was after my divorce. I wanted very much to be the “good guy” in the whole scenario, to remind the Lord how many things I had done right, how little I “deserved” to be in this difficult position, how deprived I felt, how wronged. There was no peace for me there, either. I remember a General Authority talk that helped me “see the light.” The main point was that wherever we are in our lives, we have made thousands of choices that could bring us nowhere else. We have either contributed to or allowed whatever is going on—even if only by our choice to be there in the first place. Very few “victim” stances tell the whole story. I began to see the thousands of choices we both had made over the years that could take us nowhere else but where we were. Yes, many of those choices were based on ignorance or family patterns that we both grew up with. But regardless of the reason for our choices, the consequences still apply. Only when my prayers changed to include things like, “please forgive me for the choices I made that weakened instead of strengthened our marriage,” and “I am willing to have my heart changed, to be cleansed of anger and resentment and blame” did the Spirit begin to verify that I was on the right track. Stephen A. Cramer in a talk called “Conquering Your Own Goliaths” (Covenant Communications, 1990) surprised me when he said that we are praying amiss when we say “help me to quit doing this or that.” He said we are praying about the symptom of the problem; not the problem. The problem is that our heart is not right; that we still desire to do the thing that is hurting us or others. We are asking the Lord to help us restrain those unrighteous desires rather than to change our hearts so we no longer have those desires! And that prayer “help ME to” may be focusing too much on our part and too little on God’s. The prayer that we really need is more like “Dear Lord, please change my heart, change my nature, heal my hurts, so I no longer desire to do anything harmful to myself or others. I can’t do this by myself; I need Thy help.” In other words, we need to get to the root of the problem instead of hacking away at the leaves, and we need to always acknowledge our dependency on God. Here’s another example, “Help me to stop criticizing” is hacking at the leaves. Praying with all the energy of heart for charity is getting to the root. I heard a profound statement the other day: “the antidote for resentment is compassion.” What is true compassion? Charity. I keep coming back to the need to pray for charity instead of praying for the Lord to restrain me from or forgive me for actions that result from its lack. Rod Jeppson, in his book Turn Yourself and Live, teaches the same principle in regard to overcoming addictions—that we need to turn to the Lord to heal our hearts because the addiction is nothing more than a distraction we have found to keep us from feeling the deep hurts of unresolved problems, including unforgiveness, bitterness, resentment, and lack of faith. Jesus said, “after this manner therefore pray ye,” and gave what we have come to call “The Lord’s Prayer” (Matthew 6 and 3 Nephi 13). It is eye-opening to think about what this short prayer includes: praising God, expressing willingness to submit to His will, pleas for forgiveness and to be delivered from evil, then right back to a focus on God: “thine is the kingdom, and the power and the glory forever. Amen.” The 3rd Nephi version quoted above does not include the plea for daily bread that the Matthew version does. And the Lord reminds us that “the Father knoweth what things ye have need of before ye ask him” (3 Nephi 13: 8) which makes us wonder how detailed we need to get. However, if the Lord’s prayer is so short, and vain repetitions are discouraged, why are we commanded to “pray always” and how is that possible? Why is it necessary to sometimes “pray all the day and into the night” as Enos did and why do some requests require years of praying before we feel any response at all? Our thoughts are not His thoughts, so we don’t always know for sure. Sometimes it can be because we are praying amiss, and other times the delay is for our spiritual growth and benefit. Only the Lord knows when the timing is right, when we are ready for an answer (even if the answer is “no”). Only He knows when an answer will be for our best good, when we will be strong enough to follow counsel given, or when we will be in tune enough to listen and appreciate the answer. In the case of Enos—what soul growth would he have missed had the Lord instantly answered his prayer? What did Enos learn about himself from persisting in prayer? How much sweeter was the answer because of the spiritual exercise he had been through? As soon as we learn the true relationship in which we stand toward God (namely, God is our Father, and we are his children), then at once prayer becomes natural and instinctive on our part (Matt. 7: 7-11) Many of the so-called difficulties about prayer arise from forgetting this relationship. Prayer is the act by which the will of the Father and the will of the child are brought into correspondence with each other. The object of prayer is not to change the will of God, but to secure for ourselves and for others blessings that God is already willing to grant, but that are made conditional on our asking for them. Blessings require some work or of effort on our part before we can obtain them. Prayer is a form of work, and is an appointed means for obtaining the highest of all blessings. We will not pray amiss if we follow such inspired counsel from prophets. Part of the work of prayer is pondering beforehand. D&C 9:7-8 “Behold, you have not understood; you have supposed that I would give it unto you when you took no thought save it was to ask me. But behold, I say unto you, that you must study it out in your mind . . .” Pondering, meditating, studying out in our mind is such an important part of praying. That study includes scripture study and can also include writing about how certain scripture verses might apply to us personally. I sometimes get answers in the very process of writing. To me that whole process is an extension of the prayer of peace—because it brings peace. Prayers that bring peace always include gratitude. We are counseled to “thank the Lord in all things” (D&C 98:1). What is it about “all things” that we don’t understand? The Lord can direct all things to our eternal good, yet we are often hard-pressed to thank him for the tough stuff in our lives. Can I learn to thank God for the thorns and briars and noxious weeks that afflict and torment me? Can I trust God’s all-knowing and infinite wisdom? I know for sure that kind of trust, that kind of prayer marks the path that leads to joy and peace. Most importantly, we will not pray amiss if we listen to President Nelson’s plea to “choose to do the spiritual work required to enjoy the gift of the Holy Ghost and hear the voice of the spirit more frequently and more clearly.” I’ve rarely been more spiritually motivated than I was by President Nelson’s words, “In coming days, it will not be possible to survive spiritually without the guiding, directing, comforting, and constant influence of the Holy Ghost” (Ensign May 2018, p. 96). Only the power of the Spirit can give us the sure direction we need in our prayers. Only seeking that guiding, directing, comforting, constant influence can keep us from praying amiss. Much needed and appreciated, today. Thank you!